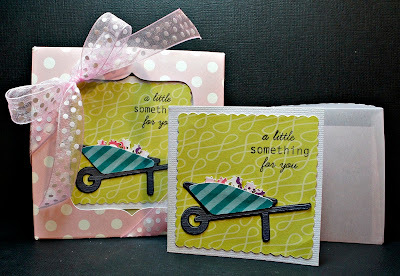 If you are following the Bitten By The Bug 2 Blog Hop you probably came from Carri's Blog--what an adorable card she made! The challenge for the hop this week was chosen by my VERY, VERY talented friend Donna. She chose the wheelbarrow from Walk In My Garden on page 107....no, I hadn't used this cut before either--and yes, it was a challenge again this week to me. 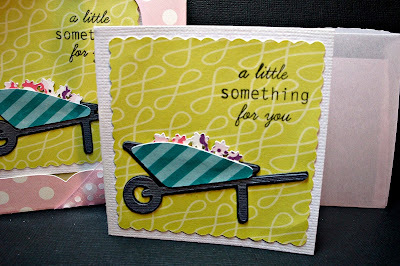 For the cards, I cut the wheelbarrow with all its layers. I cut the green background square from Lacy Labels. The sentiment is from My Pink Stamper's new set Winter Treats and Sayings. Next up on the list is my friend Agnes!!! After you see the creation that Agnes has made, please finish the hop and then play along with us and upload a project you make with a wheelbarrow. All you have to do is leave a comment (hopefully about my project) by Friday, September 30th at 10PM Central Time. The only catch is that you will have to check back on Saturday, October 1st to see if you won and send me your contact information. I will only send the prize if you contact me by Saturday, October 8th. Lacy Labels = Green Scallop Square @ 2.82"
Wild Card = Box @ 6.71" and Envelope @ 3.32"
Gorgeous box and set of cards,very pretty. What size did you cut the envelopes at to make them 3x3 as I seem to keep getting this wrong? Adorable gift set. Love the card. Super cute gift enclosure cards. I love how you boxed them up. Great gift idea. Such a great gift! Beautiful and thoughtful all in one! What a gorgeous gift idea. Please do share your mom's response to it....Happy to be a new follower! Well my dear you may have trouble with this challenge, but it does not show! Your gift box and card set is just beautiful. Your Mom is going to be trilled! TFS! Great ideas! Never thought to make envelopes from vellum and thanks for the glue tip! Great project! 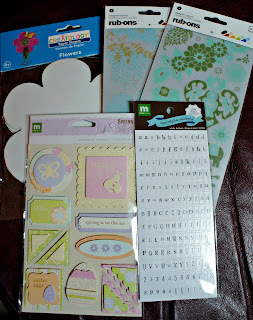 What a great idea, cute cards and box. A great idea. Pretty card.A nice gift to give. What a great set of cards!! Oh Maria this is so great and what a lovely gift! Whoever receives it is going to love it! And thanks for the tip on the glue for the vellum, I always wonder what everyone uses! Aww..this is so pretty. Just wonderful. Simple yet elegant. Great idea Maria, I love the color- green is my fav anyway, Thanks for the tip on the glue. I'm always looking for something that works well with vellum. I love coming to visit your blog. Great idea to make enclosure gift cards! Everyone needs them! I am glad you listened to your Mom! lol! Pretty flowers in those wheelbarrows too! Like the mini card. I like using vellum. Thanks for chance to win. These are so sweet Maria! I just love mini cards! Perfect sentiment and great paper! What a terrific idea to make a box for your cards! You've jump started my brain! :-) Fabulous job! Great box & card set Maria! I love this wheelbarrow cut, and what a good idea using the vellum on the envelopes!! Awesome job on the box and card. You did a super job! Thanks for the inspiration. 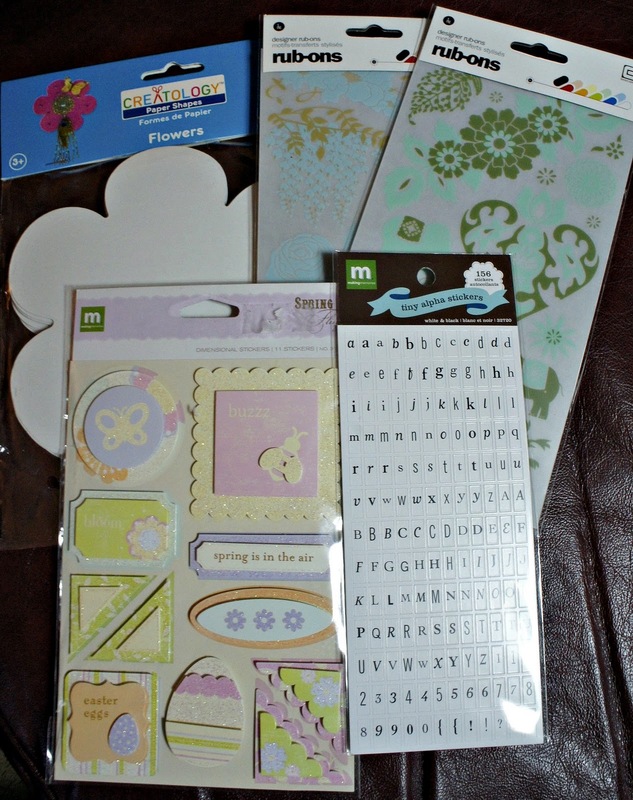 This is an adorable little set, 3" cards are just perfect as note cards and with the box it makes a lovely gift. What an adorable set of cards! Love 'em, and what a nice gift set this will make!--Pat N.
Ah Maria, this is such a wonderful take on Donna's challenge...and what a wonderful gift for your Mother. Absolutely darling set of cards. Oh, how sweet! I love the design and what a great idea! !